This article first appeared in Options, The Edge Malaysia Weekly, on May 21, 2018 - May 27, 2018. It is the quintessentially Asian thing to do: travel the world, taking in unfamiliar sights and sounds, yet seek familiar flavours. It is no secret, after all. How many people do we collectively know who won’t leave London, for example, without first indulging in a thumping big portion of lobster noodles in Bayswater or a dim sum lunch at Royal China? Besides, Asian flavours rank among the world’s best-loved and the national dish of Britain is, in fact, chicken tikka masala. 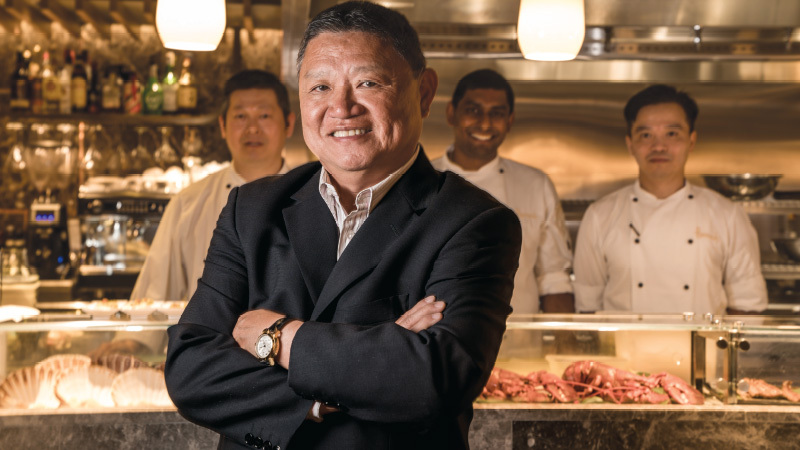 Just as the world is getting flatter and external influences are being absorbed and adapted at lightning speed, London has firmly established itself as a key gourmet destination and it’s a wave that Malaysian-born Eddie Lim is riding with relish. As CEO and partner of the London-based Mango Tree Group, which owns or has invested in a total of 10 restaurants all over England, Lim’s best-known one is undoubtedly Mango Tree, the award-winning Thai dining room in swanky Belgravia, which was mentioned very favourably by JK Rowling in her 2014 crime fiction novel, The Silkworm, published under the pseudonym Robert Galbraith. But it is Lim’s latest string of ventures that is putting Malaysian cuisine at the forefront of the Asian food offensive in one of the most competitive cities in the world. With three outlets in Knightsbridge alone along with Chi Kitchen in Oxford Street and Singapore Garden in Fairfax Road, the affable Lim upped the ante markedly when he unveiled Chai Wu. Gorgeous and gleaming, the restaurant is located on the fifth level of Harrods, the legendary Brompton Road bastion of luxury goods and retail. With its striking interiors, heady mix of opulent design, slick service and pan-Asian cuisine, Chai Wu has already attracted some of the most famous people in the world, including assorted Beckhams and Kardashians. Popping by for lunch on a recent visit to London, I plonk myself in a cosy booth and spy Barbour, the most British of brands and of iconic waxed jacket fame, through a panel of wooden beams. Meanwhile, I hear a young couple exclaiming “wow” as they stride past Chai Wu, which, by the way, takes its name from the Chinese words for “wealth” and the number five, in reference to wu xing, the quintet of philosophical elements of earth, wood, metal, water and fire. These characteristics are further captured in the restaurant’s decor, which boasts marble, leather, timber and a design-conscious charcoal grill at its heart.back home!” A moveable feast? You could say that. For the full story, pick up a copy of The Edge Malaysia (May 21) at your nearest newsstands or visit optionstheedge.com.